How did you come to be at Polesden Lacey? I’ve been here for nearly three years. Before that I was at Nyman’s and prior to that I was at Chartwell, Winston Churchill’s house. I was there for five years including a three-year National Trust apprenticeship. Before that I had been working in film and television production for about 15 years when I decided on a big career change. 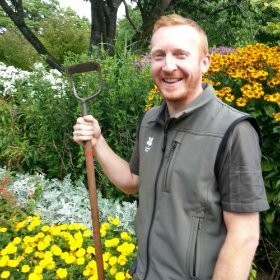 Gardening was already my hobby and I was fed up of working long hours in a dark little studio, so I thought why not turn my hobby into my career? What are the main seasonal jobs? Summer is about the regular maintenance – mowing, edging, deadheading, weeding, harvesting and watering in times of drought. Autumn is probably our busiest time with hedge cutting, turf care and bulb planting. We’ve planted 12,000 bulbs this autumn, on top of about 55,000 over the previous two years. We usually try to get any new planting done in autumn when the soil is still warm and wet to allow the roots to bed down before winter. Do you have a favourite part of the garden? The dedicated spring borders are probably my current favourite because they’re quite a new scheme that we’ve designed and planted over the last couple of years. They’re a modern take on Edwardian flamboyance. What’s the best bit about your job? Every day is different, there’s always something new to learn, so it’s never boring. Are there any new plans for the garden in 2018? There’s a lot of redevelopment and improvements going on in the herbaceous borders and the rose garden. We’ve invested a lot in improving the paths in recent years to help with accessibility, and we’re hoping to spread out from the formal gardens into the pleasure grounds with new projects. • OPEN Daily except 24 and 25 December. 30 Oct – 4 Feb 10am-4pm; the rest of the year 10am-5pm. House and facilities have different opening times.